Shown with a Heathered Fatigue Swiftly and Fatigue Still Pants. I got my Heathered Fatigue Cool Racerback today. I love the color but it is another thin CRB. For those of you who have tried on the Poseidon CRB, it feels a lot like that. I am going to keep it since I love the color but I wish it was a little thicker. I'm interested in the Fatigue Green CRB if it comes to Canada. Not really loving the bright orange (Pizzaz?) stitching though, but I guess it doesn't matter much being that it's on the inside anyway. Also interested in the Fatigue Bhakti Yoga Jacket. Was never a fan of Fatigue Green but it's been growing on me lately, the more I see of it the more I'm liking it, thinking it will be an especially nice colour for fall. I think it's a flattering colour for most people too. Thanks for the review, LLA! I gut says it's the make up of the heathered yarns themselves that gives the heather CRB's that thin, more slick feeling. When you're working with heathered yarns, you don't typically have a lot of options. I like it in the CRB's because it decreases the weight and is not as prone to pilling, however I just returned the heathered blue denim WUC II b/c it was too thin for a bottom. The old heathered CRBs were not thin and icky. What gives? Does the heathered cranberry CRB have the same thinness and slick feeling? Missed out on that one & didn't see it in stores. @545 -- The cranberry is thin & slick. I like some of the thinner ones so I'm happy with it! I like the thicker CRBs for "out and about", but I will say these thinner ones are nice to work out in on very hot days. I have the heathered cranberry and heathered naval blue CRBs and both are thin and slick, but I don't mind (I do prefer my older thicker heathered CRBs of yore but loved the color of both enough to overlook that!). @ Anon 10:51 PM - I know! Cheapening of the product one would gather. I will have to examine the heathered fatigue CRB in store. Tried to do so today but Cumberland (Toronto) did not have it. Unfortunately am already prepared to not like it. @ Anon 5:45 AM - the heathered cranberry is shiny, thin and icky. It's also dingy with the grey in it. * Toronto shoppers, if you're after either a white CRB in size 2 or 10, or a heathered jewelled magenta in size 12, they were on sale for $29 on the regular CRB rack. Only two white and one jm. They had a markdown rack going, I didn't really look. Only thing I noticed was some misty mist ii jackets. I looked at the Sun to Moon Scarf and was sort of underwhelmed. Waiting for the reviews to come in on this item as I bet is snags easily. @Sophie - I was trying to remember back to when I got my Jeweled Magenta CRB and whether it felt harsh to me when I first got it and if it softened up with washing because it feels soft to me now, too. I thought the Cranberry felt very harsh to me so it's good to know that yours feels soft to you. @ anon 5:45 am - it does feel the same as the heathered fatigue. I have heathered cranberry and do not find it shiny or icky. Yes it was rough-ish to touch initially but it softened up completely after a wash. Now it's silky soft. Same with the heathered jeweled magenta and poseidon CRBs. @LuluAddict Yep, after I posted my comment earlier it occurred to me that washing might be the key to softness with these. Because i've washed all my other heathered CRBs a few times, but not this fatigue green one yet, so I bet that's why it feels less soft by comparison. I do find I've grown to like the feel of these heathered ones more with time. I absolutely love my jewelled magenta one now - makes sense because I've had that one the longest so it's the most "broken in". Anon @5:45am here: Thanks for all your input regarding the cranberry CRB texture. heathered fatigue; heathered cranberry; etc)seem to never make it to stores and seem to be online only. Very strange as these heathered CRB's invariably sell out online & are popular to many of us. 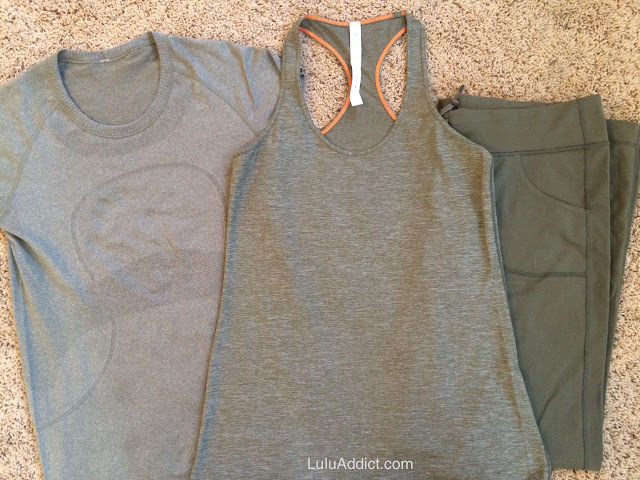 As much as a lulu lover I am; this kind of thing has helped me curb my lulu spending. I want to feel the texture of a CRB & try on (since I live close to 3 stores ), rather than hoarding a treasured heathered CRB online (from those who have no access to stores)and purchasing online only to do the buy-&-release game. Perhaps Lulu should label these heathered CRB's as online only? I also feel I now need to try on other Lulu clothing items , especially with the recent photography changes & lack of store photos. It must be really, really hard for those who have no access to Lulu stores and have to deal all of this, especially with the potential of a $5 return fee per order. With all of these recent changes and lack of store appearances of items that are sell-outs & popular (like heathered CRB's); I am glad this opened my eyes & take a step away from Lulu & not do so much impulsive buying online. (I dislike buying an item impulsively online at upload b/c I don't know if that item will ever appear at my 3 local stores and guessing my size for that item). The poor store educators/key leaders do not know anymore than we do about heathered CRB's or other "exclusive" items ever showing up in the store (other than if it were a chance online return by a customer). Sometimes exclusive items are not labeled as "website exclusive." Sometimes an exclusive item may show up to one store than not another. However, with a paucity of store photos; we can no longer order & do a charge-send since we don't know which store has the exclusive item (esp when it is already sold-out online) & we can depend on those photos/reviews for any sizing ? 's that made us hesitate to order the sold-out item in the first place. Thanks for your hardwork, LuluAddict & all those that post comments. Your blog & the commentaries are definitely more enlightening than the Lulu website itself. The Lulu product feedback is helpful, but sometimes the Lulu site feedback magically "disappears," esp if that item has been placed in WMTM. Interesting info on the softening with washing. However, didn't have to do this in the past with heathered CRBs to know they were "good" and soft. Makes me cringe to think how much chemical has been added to it that you're then trying to get out. LLL is doing a disservice to the customer. I'm only allowed to bring it back if I haven't worn it and the hand tags are on. Now I have to rip off the tags wash it a few times to see if maybe the "quality" will improve? Kinda ridiculous. My old heathered CRBs are so nice. The new ones are crappy. It's so irritating. I love heathered and when they give us thin, cheap and scratchy I refuse to buy them. Heathered menthol and heathered smoky rose might be the last of the good ones that I can remember. I think I bought them in 2011? Anon @5:45 an here --thank you all for your feedback on the heathered cranberry CRB. (lullaby; naval blue; fatigue;cranberry;slate) did not seem to make it to any of the stores. With the exception of heathered naval blue; all of the heathered CRB's invariably sell-out online; but are not marked "on-line only." I live close to 3 stores. release transaction b4, but lately I am so tired of doing this. However, b/c I choose to snooze, I "lose." -- but on the upside, it's making my wallet happy & making myself feel relieved that I don't "need" an item. invariabilities and the $5 return charge. product photos has made this worse. Not complaining at all...As much as I love Lulu; I am just a little perplexed by the company. I am happy to see myself finally "let go" a little from the Lulu bandwagon. First world problems. 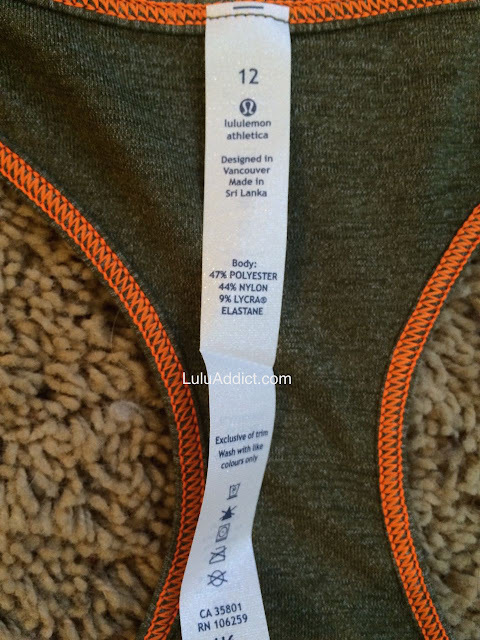 Thanks to your blog, LuluAddict & fellow commentators. I learn so much from your observations & try-ons & opinions. The rating comments on the Lulu site are also helpful, but at times comments just "disappear" when they are on WMTM. Anon Aug 30 at 8:08 PM - I agree, I have to do the majority of my Lulu shopping online, I only get a chance to shop in store every once in a while(definitely not very often), and Lulu makes this so hard to do with their sizing inconsistencies, quality issues, etc. For example (this one is a double whammy - both a quality issue and a sizing issue! ), yesterday I made a special trip in to my closest store, it was my birthday store shopping trip, plus I took this opportunity to return my new Angel Wing Scuba II that I had ordered online that had the top of the Lulu symbol sewed on unevenly - it didn't match up evenly at the top on both sides of zipper(they damaged it out). Then, as I was looking for a new Scuba II to exchange with(they didn't have any left in Angel Wing!) I had a sizing issue to deal with! I have many Scuba IIs, all from end of last summer up until quite recently, and the size 4 has always been a perfect fit for me, well, that is up until yesterday! I tried on 3 of the newest Scuba II colours, the Ghost Manifesto Script, the Black Butterfly Texture, and the Rocky Road, all three in my usual Scuba II size 4 were fitting different than usual, they were all bigger and shorter in length! They had the Ghost Script one in a size 2 so I tried that one on and it fit just like all my size 4s do except for being a bit shorter, so I ended up getting this one, since it was the closest fit to what all my other Scuba IIs fit like (and the girl helping in me in the fitting rooms said it looked like a perfect fit). Even the fairly recent Angel Wing fit like it should, I also have the fairly recent Dashing Purple, Tranquil Blue, and Deep Navy ones and they all fit just fine too! So, it just seems to be all the newest Scuba IIs that were released within the past week that have a weird fit! I find things like this incredibly frustrating. When we know our size in something like this that we have been purchasing regularly, we should be able to feel confident in ordering that same item in that same size online and it should arrive fitting as it should(and preferably without quality issues as well!). If I hadn't had a chance to shop in store yesterday then I would have had (another!) Scuba II to return to store or ship back because it didn't fit properly! This certainly makes me hesitant to order online, I find when something like this happens (this kind of thing has also happened to me before!) I tend to be put off buying for a while. It's just such a hassle to ship back or try and make a special trip in to closest store to return (something that should have fit to begin with!!!) Also, things sell out so quickly online, that by the time we get our order(takes a week for me) and then find out out there is a quality issue or a sizing issue, then that same item is already sold out and we're then out of luck! Super frustrating! Also, I do not want to start having to order two sizes of the same item just to be able to get one that fits, then have to go through the huge hassle of returning the one that doesn't! Ugh! Lulu, please get it together! I've been very loyal, but am beginning to lose hope here. To top it all off, they've just recently changed the TaTa Tamers and I'll no longer be able to purchase my size 32E(thanks Lulu!). The 32DD is a definite no for me, I tried one yesterday, it's too small. :( Sorry for ranting everyone. I think I've just had a bit too much Lulu bad luck recently. Anon @ 8:33 Am: I am sorry for your recent bad luck with Lulu. I feel the same way you do! It's hard to buy multiples of the same product in different sizes online only to return. Moreover,you received a defective scuba in your true scuba size that didn't fit and is now sold out. This has happened to me as well with other Lulu items (CRB's, textured WU crops that ran big )....I feel your pain. inspections; offer free shipment back (in this type of case); expedite returns & re-crediting our accounts for returns; have the store call another store within the nation & find that Angel Wing Scuba for you. We do pay for Lulu & should be getting better customer service instead of us asking. What if I am a new customer to Lulu and I am not aware of the above options... . Then Lulu would be a TOTAL turnoff to me!